Don’t miss the last Bull Circle! VENUE: Henry Sy Auditorium, 5th Floor, St. Luke’s Medical Center, Bonifacio Global City. For map to St. Lukes, click HERE. SPEAKERS: Christine Jacob-Sandejas, TBRDM Alumni, to share her experience running her first marathon at TBRDM. Lit Onrubia, Chi Running Instructor and head coach for Bull Sessions to discuss tapering in the next few weeks. Q&A Portion: TBR Dream Team to answer your questions on the race. 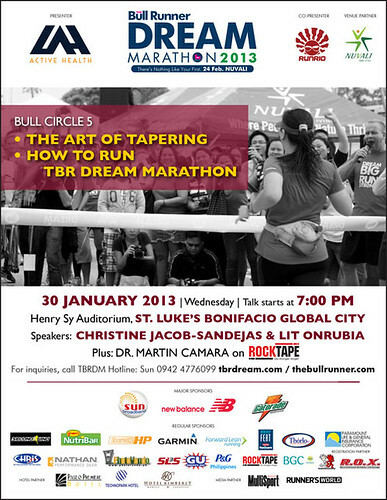 There will be FREE taping of Rocktape for the first 30 registrants. Those not included in the first 30 may have themselves taped for a fee. BULL CIRCLES are a series of running talks from October 2012 to February 2013. The talks are free of charge and open to the public. No pre-registration is required. For TBR Dreamers who have NOT claimed their official shirts, you may claim your TBR DM Official Shirts during the event. After this event, TBR DM Official Shirts may be claimed at Secondwind Running Store, Ortigas Home Depot. For any questions, please contact TBR Dream Hotline at 0942.477.6099 or email tbrdream@gmail.com.